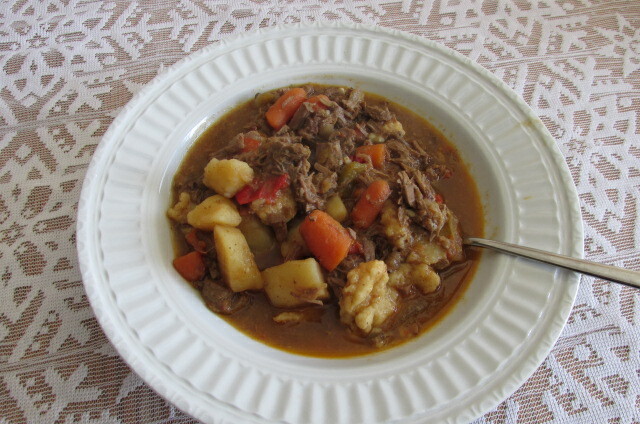 Being stuck in the house trying to keep warm I always want hearty food. My dad brought this recipe home from work while I was growing up. His buddy at work had it for lunch one day and gave some to my dad. My dad raved about it and the man’s wife sent him the recipe for my mom. My mom made it a few times and everyone loved it. She made it again this past summer for the first time in years when my sister came into town for a visit. I had completely forgotten about it. When I visited with my sister at my mom and dad’s, my mom sent some home for Brandon’s dinner and he really liked it. I didn’t have any then but made it a couple months later because he liked it so much and it is now on the rotation of soups I make! My mom told me it was too many steps so she quit making it. Well, it is worth it. Here is the recipe. The original my mom gave me didn’t have quantities, just descriptions like “dishes of paprika until a nice color” for the ingredients so with a little trial and error this is what I have come up with. I tweaked it a bit. 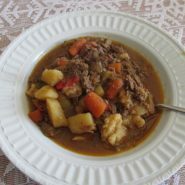 I added the beef broth (the original used just water) and I used way less butter…. The only thing to add to make it stupendous is some really good bread! A nice French bread with a nice crust use to dip into the soup! Give it a try, it’s yummy!!! A hearty meal the whole family will enjoy. Perfect for a cold winter's day or any time! In a large dutch oven or stock pot melt butter over medium high heat. Add half of the beef to the pot and brown. Remove from pot and add remaining beef and brown. Slowly add beef stock to the pot and scrape bottom to loosen the browned beef bits and add the remaining browned beef to the pot. Simmer for about an hour. In a saute pan melt 2 Tbsp Butter. Add onion, celery, carrots, peppers salt, pepper, paprika (enough to make it a lovely red color) and the caraway seeds and saute for 5-8 minutes until veggies are softened. Add to the stock pot and simmer until beef and carrots are cooked through. Add potatoes to the pot and simmer until cooked. In a bowl add flour and salt. Make a well in the center and add the eggs and mix well until dough forms. Spread dough on plate and cut into strips and add to simmering pot. Simmer 20 to 30 minutes until dumplings are cooked.